Something cute and cuddly is making history at the San Francisco Zoo. 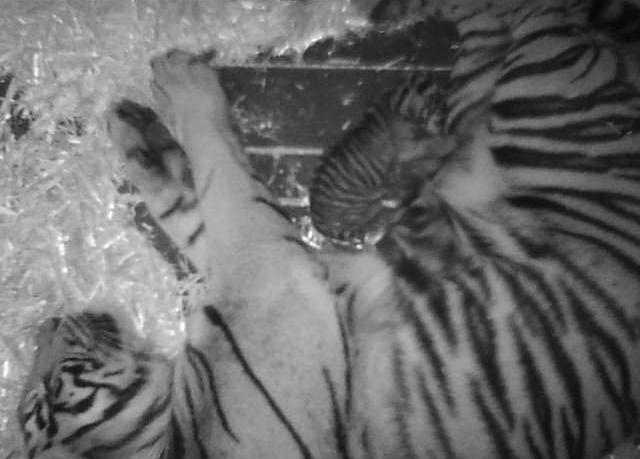 An endangered Sumatran tiger has given birth to a cub–an addition to a wildlife population estimated at less that 400. Born Feb. 10, the cub’s gender is unknown until its first wellness examination, which will take place in a few weeks. Zoo officials say mother and cub are bonding in the Lion House, which is closed to the public until further notice. What makes this birth even more notable is the participation of Leanne in her prenatal care. 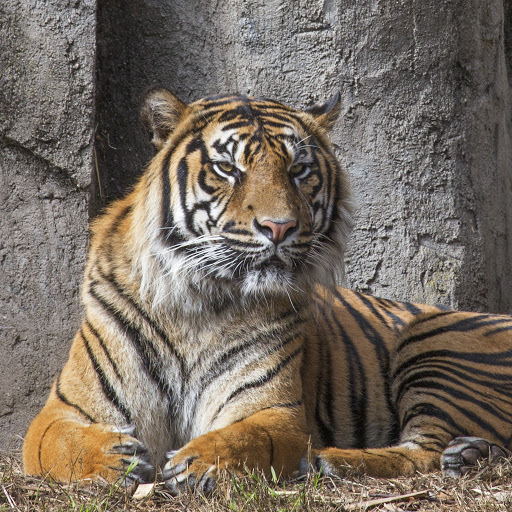 As part of the SF Zoo’s ongoing wellness program, Leanne is one of the few tigers in the world trained to receive examinations and prenatal sonograms while awake. The Zoo’s carnivore team of curators, keepers and veterinarians created a special examination bench that allows Leanne to receive medical evaluations and examinations without the need for general anesthesia. Through this set up and with extensive training and food rewards, Leanne received a weekly prenatal ultrasound, and is also trained for injection, vaccination and weight procedures. Leanne is a nine and a half-year old female Sumatran tiger. She came to the SF Zoo from the San Antonio Zoo in 2006. This birth is her second litter; her first was in 2008 when she gave birth to three males, who were transferred to other zoos to participate in the Association of Zoos and Aquariums’ Species Survival Plan. Leanne is named for the late Leanne Bovet Roberts, a former SF Zoo trustee and very generous donor and supporter of animal care organizations. This birth represents the first tiger born at the SF Zoo since 2008. Prior to that, the last litter of tigers born at the SF Zoo was in 1976. The Sumatran tiger (Panthera tigris) is classified as Critically Endangered, with the greatest threat to the species survival being destruction of habitat, followed by poaching. From the island of Sumatra, off the Malaysian Peninsula, these terrestrial and nocturnal cats inhabit evergreen, swamp and tropical rain forests as well as grasslands. As the smallest of the remaining subspecies of Panthera tigris, the Sumatran tiger is particularly well suited for life in the deep jungle. The fur on the upper parts of its body ranges from orange to reddish-brown, making it darker in color than other tigers. This helps it to hide within its heavily wooded forest habitat. Also unique to this subspecies are distinctly long whiskers, which serve as sensors in the dark, dense underbrush. Males weigh between 200-350 lbs., and females between 180-300 lbs., with a head to body length of 7.2 – 8.9 feet, and a tail length of 2-3 feet. In the wild, the carnivorous Sumatran tigers eat mainly wild pigs and sambar deer. While at the Zoo, the tigers receive fortified horse meat, chicken and rabbit. Sumatran tigers are usually solitary and prefer to live alone, except for courting pairs and females with young. Females are sexually mature between 4-5 years and give birth every 2-2.5 years. After a 102-112 day gestation, a typical litter of 3 or 4 is born. Until recently, there were nine subspecies of Panthera tigris. Three subspecies, the Caspian, Bali and Javan tigers, were deemed extinct between the 1940s and 1970s. 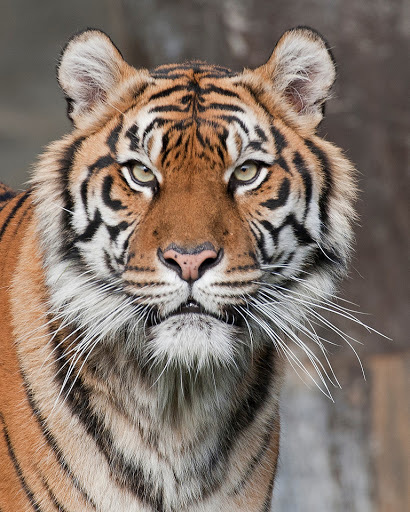 Estimates to the six remaining subspecies in the wild are as follows (according to IUCN Redlist): Bengal 1,706, Indochinese less than 2,500, Sumatran less than 400, Amur (Siberian) 360, Malayan less than 750, and the South China tiger is thought to be already extinct in the wild. These remaining subspecies are either listed as endangered or critically endangered. The mission of the San Francisco Zoo is to connect its visitors with wildlife, inspire caring for nature and advance conservation action. Nestled against the Pacific Ocean, the San Francisco Zoo is a 99-acre urban oasis. It is home to nearly 700 exotic, endangered and rescued animals from all over the world and lovely peaceful gardens full of native and foreign plants.